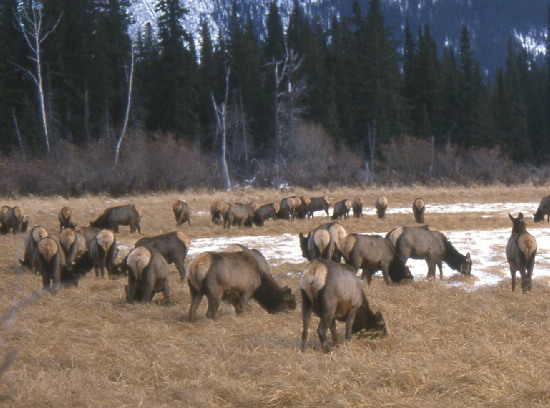 Grazing elk in Banff National Park welcome you to this month's issue of Whispers. Welcome, once again to Whispers, the newsletter of the Dereila Nature Inn - your cyber nature centre. Many thanks for subscribing to our newsletter. We really appreciate your support. It's been another busy month at the Inn! We hope you enjoy the new features that have been added. What land animal is one of the biggest and strongest, yet is also one of the most peaceful? It's been very busy at the Inn. Here are the latest additions. Just click on the images to go directly to the page. Enjoy this collection of images featuring birds photographed in beautiful Hawaii. Over 30 scenic photos from America's first National Park. Along the sea shores you can find a wide variety of plants that thrive in the ever shifting sands. A visual display of the floral symbols of the Canadian provinces and territories and American states. The importance of water at a bird feeding station is demonstrated in this At A Glance collection of pictures visiting for a drink or a bath. Once again we have two contributions. 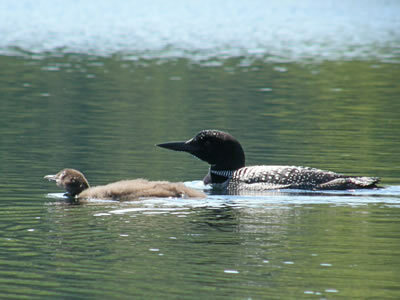 Claudia from Scotia, New York, sent us this image of a loon watching over its offspring in Pyramid Lake, in the Adirondack Mountains, NY. 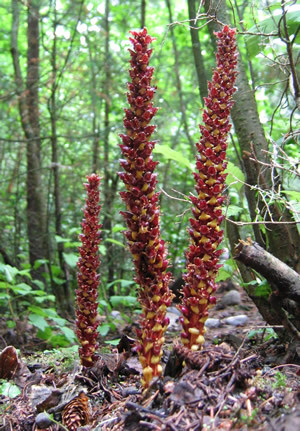 Below, this woodland parasitic flower, Northern Groundcone, Boschniakia rassica, was kindly sent to us by Lelia Crosby from Chapel Hill, NC. Thanks so much for these wonderful contributions! 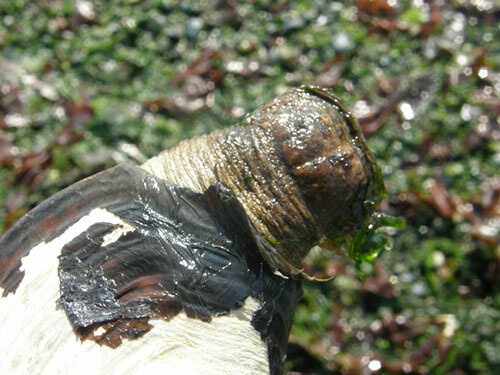 ~~~~~~~~~~~~~~~~~~~~~~~~~~~~~~~~~~~~~~~~~~~~~~~~~~ This month, we head back down to the beach for our wandering image where we come upon a Horse Clam, Tresus Capax. 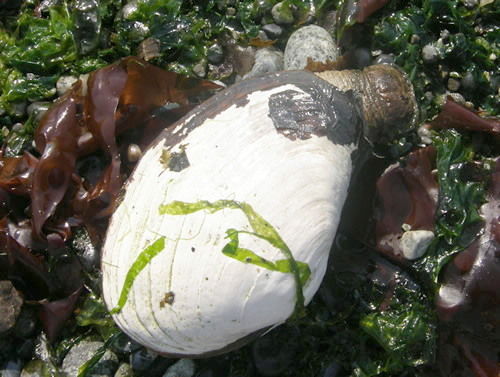 It is usually just the empty shells that one comes across when walking along the shores. This was a little different to the usual ones, though. These shells did not close completely and it was strange to see its foot poking out. 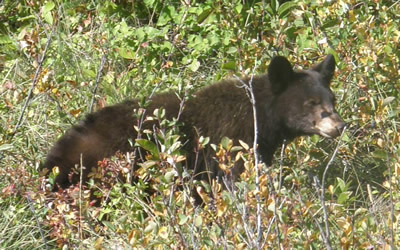 This month we have some autumn pictures from Big Hill Springs Provincial Park in Southern Alberta. Although this is a small park it's a very pleasant spot to visit at any time of the year. 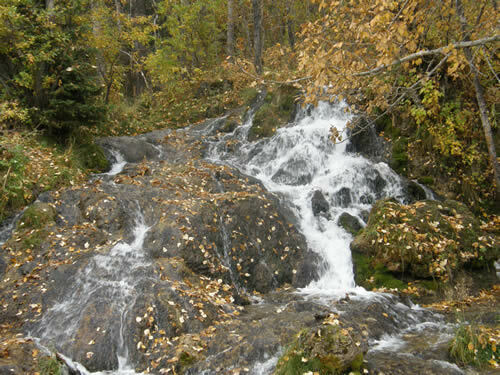 The main feature is a series of waterfalls which flow all year long. 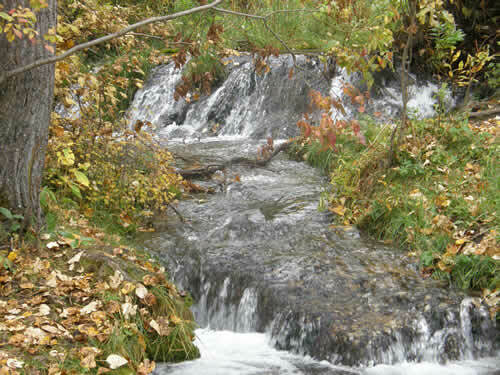 A walk along the waterfalls takes you away from the hustle and bustle of every-day life. These photos were taken on a recent autumn day. 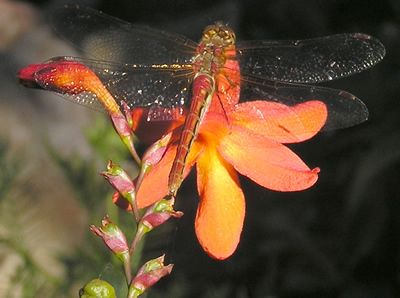 If you study this picture of a dragonfly for a while, perhaps you'll come up with a few funny captions. Number one: "Just pretend I'm not here!" Number two: "This isn't my best side, you know." Sometimes things aren't what they seem to be! 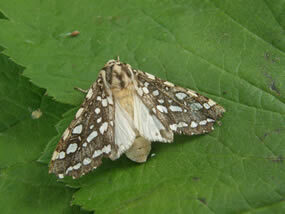 The image on the left of this moth, Lophocampa argentata, was actually taken after the one on the right. 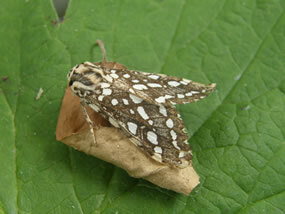 It was found on the curled up, dried up leaf in a greenhouse and presumed dead. We wanted a record of it for our files, so picked up to be photographed. Deciding to take the picture with the green leaf as a good background, we tried to pry the moth from the leaf very carefully with a thin twig. 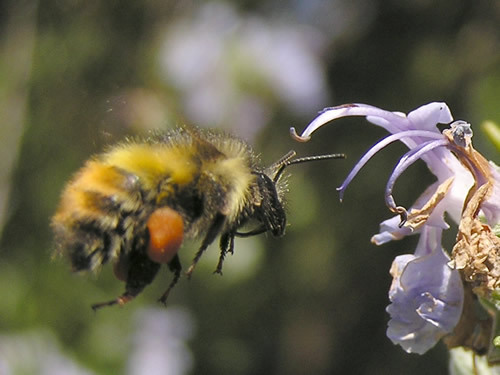 To our amazement, it let go after a while and we discovered that it was alive. We took a series of photos and then the little fellow took off leaving us some lovely photos a little lesson on the importance of checking things twice. This month's tip involves some planning ahead, a fast trigger finger and a bit of luck. 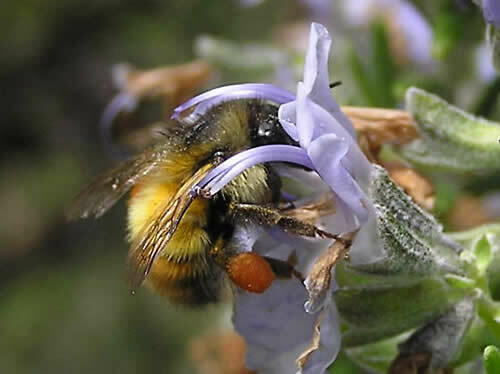 The bee is a Bombus melanopygus. It may not always work, but with some patience, careful observation and planning ahead you might just capture something unique. Baby Bear goes downstairs and sits in his small chair at the table, he looks into his small bowl. It is empty. "Who's been eating my porridge?!!" he squeaks. Papa Bear arrives at the big table and sits in his big chair. He looks into his big bowl which is also empty. "Who's been eating my porridge?" he roars. Momma Bear puts her head through the serving hatch from the kitchen and yells, "I HAVEN'T MADE THE DAMN PORRIDGE YET!" As the chilly, frosty weather arrives for many of us, remember that the birds still love fresh and unfrozen water throughout the winter months. 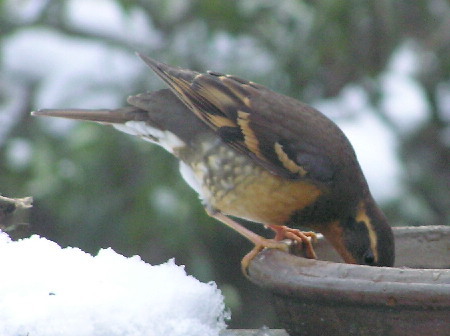 They will appreciate the water as much at this Varied Thrush does. Our next issue will be in your Inbox in the first week of December. See you then! 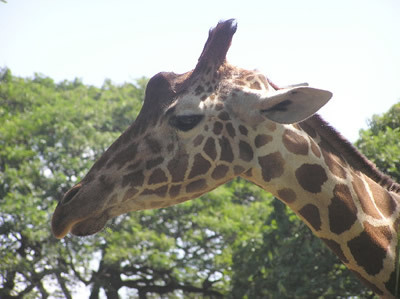 The tallest animal on land and one of the strongest, but yet one of the most peaceful, is the giraffe.